Out, damned spot! out, I say! One; two: why, then, 'tis time to do 't. Hell is murky! Fie, my lord, fie! 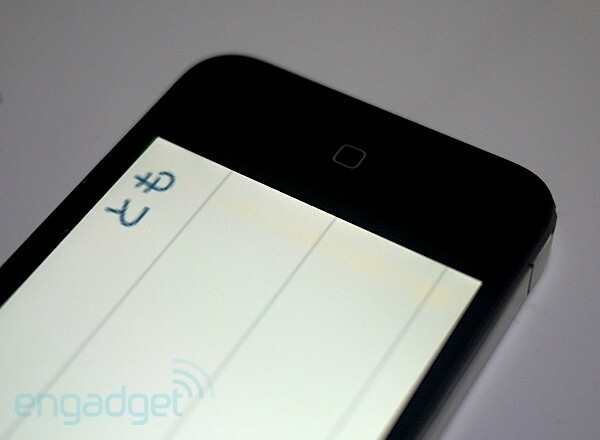 Reports are coming in from some of those lucky early iPhone 4 users that there may exist a not-so-lucky yellow coloration in the bottom right corner of the IPS LCD. We haven't seen this ourselves on any new iPhones, but maybe you've had different experiences. Tell us, is your iPhone 4 seeing yellow? Update: As a number of readers have pointed out, there seems to be an issue with how many bars are displayed on screen -- perhaps even a correlation to how it's being held in the hand. According to Walt Mossberg's review, Apple has acknowledged the issue as something that has to do with "the way the bars are presented, not the actual ability to make a call," and that a fix is forthcoming. Indeed, as noted in our review, we've had "far, far fewer dropped calls than we experienced on our 3GS." We're not seeing very many videos showing more dropped call, but the bar change is interesting. Still, to be sure, we're adding another poll.